The Bonny Eagle girls dominate Class A and the York boys end a long championship drought. BELFAST — Falmouth sophomore Sofie Matson and Mt. Ararat junior Lisandro Berry-Gaviria won top individual honors Saturday at the Class A cross country state championships. In defending their state titles, Matson and Berry-Gaviria ran the fastest times of the day over the 5-kilometer course at Troy Howard Middle School in a meet moved up and condensed by organizers to avoid an expected storm. Despite falling at the start when she slipped on the muddy grass, Matson ran a time of 18 minutes, 33.51 seconds to pull away from Gorham junior Kate Tugman (18:49) and Edward Little senior Jillian Richardson (18:56). The second-fastest time of the day was by Cape Elizabeth sophomore Lila Gaudrault, who won the Class B title in 18:42. 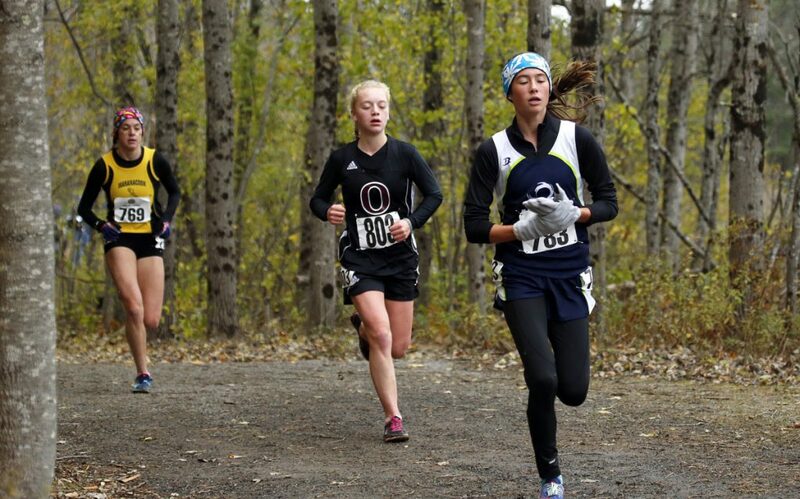 Maine Coast Waldorf sophomore Olivia Reynolds won her second straight Class C title, in 19:05. Among teams, the Bonny Eagle girls ran away with Class A by 43 points over runner-up Falmouth, which edged defending champion Camden Hills by a tie-breaking comparison of sixth runners. In Class B, Ellsworth nipped defending champ Yarmouth by three points with York another seven back. Orono won Class C by 25 over Maranacook. The class champions qualify for the New England meet in two weeks in Manchester, New Hampshire, along with Camden Hills, Falmouth and Mt. Ararat, and any girl whose time was among the top 25 individuals, regardless of class. For boys, Berry-Gaviria blazed to a 15:35.40 finish. No one else in any class broke 16 minutes. Fryeburg Academy senior Alfie Walker won Class B in a sprint over Freeport sophomore Martin Horne, in 16:18. Waynflete senior Henry Spritz defended his Class C individual title in 17:03. In team competition, Scarborough squeezed five runners among the top 23 to easily outdistance Bangor in Class A. In Class B, York claimed a state title for the first time in 70 years, slipping past defending champion Lincoln Academy by four points. Maine Coast Waldorf beat Orono by 16 points in Class C.
Bangor, Brunswick and Greely also qualified for the New England meet, along with individuals from other teams who ran among the top 25 times.